So what happened? 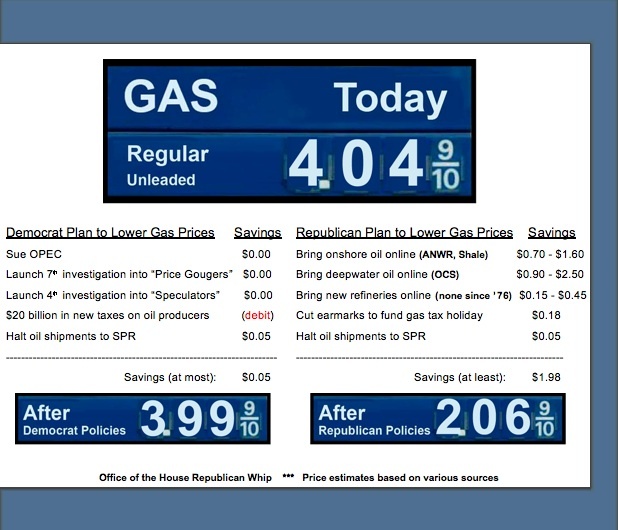 When the Democrats achieved their majority, the retail price of regular reformulated gas was $2.22, according to data compiled by the U.S. Department of Energy. This week, the price is more than $4.00. They have had the legislative majority to do something about oil prices, yet have done nothing in the 18 months in power. They even scheduled a news conference on Capitol Hill today to discuss gas prices – but it was cancelled That’s because the Democrats do not have an energy policy or any means to fix the problem. Majority Leader Harry Reid spoke from the same script as his House counterpart, Nancy Pelosi, “we cannot drill our way out of this problem,” That was in response to John McCain’s call to open open up offshore drilling. Instead the Democrats proposed that the oil companies already have leases on 68 million acres that they’re not tapping. So their plan is a demand that the oil companies begin drilling before the end of the year – or loose their leases. The Arctic National Wildlife Refuge, with recoverable reserves estimated at 10.3 billion barrels. Offshore areas, with reserves estimated at 18 billion barrels. Oil shale stores in the West. In Utah, Colorado and Wyoming, representing reserves of 800 billion barrels. We consume approximately 22 million barrels of oil a day or about 8 billion barrels of oil a year. We import over 60% of the supply. If we removed the restrictions to allow the drilling of our reserves we could stop importing oil and this would effectively drive down prices. This would help to stabilize our economy and give us time to develop alternative methods that would secure our future. But no, the Democrats are silent on this, stalling until the election in hopes that we suffer higher oil prices as punishment for having a Republican in the White House. Unfortunately Barack Obama and the Democrats have no energy policy, so it might be up to John McCain to solve the problem for them. While the nation fumes over oil prices the Democrats can only point fingers and scribe a big 0. Saudi Arabia recently arrested over 500 terrorists plotting an attack on their oil installations (See recent post on my blog). How much trust do we want to place on oil located overseas, where our enemies can reach it so easily? Do you have an account there? I’ve never heard of the site. They told me if the “rubber stamp congress” was kicked out they would help bring gas prices down. I guess not. Check this out! Right on the money!